Roll Call posted a fascinating article on Wednesday detailing the growing sense of concern (or perhaps it would be more accurate to call it PANIC!) that many Congressional Democrats—especially those in marginally safe to contested seats—are experiencing over the rolling catastrophe of Obamacare’s implementation. For those who opposed the passage of the law in the first place, it’s a somewhat satisfying scene, which Jonah Goldberg is correct to refer to as a sort of “Schadenfreudarama.” Now, granted: it’s not a completely satisfying sort of schadenfreude; it would be much more satisfying if the consequences of the massive failure only affected those who insisted on pushing the thing through in the first place, and didn’t involve millions of people losing health insurance plans that they liked, with millions more likely on the way—along with the hardships that fact will entail for so many people. But in these days of chaos and confusion, I suppose I’ll take comfort in what little scraps of enjoyment come from watching those who supported this massive act of legislative malpractice scramble to save themselves from the consequences of their actions (which, of course, they had repeatedly been warned about). According to Sumit Nijhawan, CEO of Infogix, a data security firm working with private insurers, even if the White House can fix the problems associated with the site, they’re going to find new ones immediately. Nijhawan also warned that the systems that allow CMS and health insurance companies to exchange information are nowhere close to being ready, meaning tech problems could last years. So we’re still at the “solve the initial problems so we can get to the other, much larger problems that lurk behind them” stage. This problem was actually identified soon after the HealthCare.gov launch on October 1, when news reports included quotes from IT professionals speculating on whether the problems with the site stemmed from heavy traffic or signaled a deeper problem with the site architecture. (Spoiler alert: they pretty much all said it was the architecture.) This has been a topic of continual discussion; here’s a similar article from October 22 – the coders who were building the site knew it had major problems. Here’s another one from last week. And the White House has responded; as far back as October 20 or thereabouts, the administration began talking about a “tech surge” and has s brought in people from Google, Oracle and other big tech firms to help. Congressman Serrano is apparently unaware that, metaphorically at least, Bill Gate’s red phone has been ringing off the hook for the last month. That hasn’t changed the fact that pretty much the only person publicly insisting that the website will be ready for prime time on December 1st is Jay Carney. One might also look at Serrano’s quote and note that if this were a private sector operation, he wouldn’t be able to so blithely suggest that we just bring in the best and the brightest to fix the mess after having spent hundreds of millions of dollars to hire a company with a track record of failure on major government IT projects in order to build the central public element of the organization’s biggest public initiative, only to see them create a massive coding nightmare that doesn’t work and may take years to untangle. Let’s hone in on that element of this fiasco: the sheer wastefulness of the website alone. The government spent hundreds of billions of dollars to build this barely functional site. Is Serrano concerned in any way about that? Is he concerned in any way about the fact that the government that he and his colleagues tasked with building this system failed utterly to bring in the best and brightest on the first attempt? On what basis does he have any confidence that they’ll do better on the second attempt? And is he even concerned about what the fix will cost? On that topic, here’s Congressman John Duncan, Jr. of Tennessee checking to see if anyone in the administration knows the answer to that question. Part of me dies a little inside when I realize it surprises me that someone in Congress even thought to ask that question. How can any reasonable person take that statement as anything less than an insult to their intelligence? Is he actually claiming that the “if you like your plan, you can keep your plan-period” promise wasn’t a central feature in the debate over this law’s passage? Recall, this bill squeaked through the congressional process over very loud objections from many different quarters. It wasn’t an easy sell in the first place. This was, after all, the legislative horror show that gave new meaning to the term “Louisiana Purchase” and introduced us all to the phrase “Cornhusker Kickback.” Remember the “Slaughter Solution” that saw the House Democrats come close to simply “deeming” the Senate version of Obamacare passed in order to avoid forcing vulnerable members of the then-majority to take another difficult and increasingly unpopular vote in support of the law? If President Obama had come out and assured the American people that “if you like your plan, you can probably keep your plan,” the course of legislative history might well have changed. So let me begin by saying this: I know that there are millions of Americans who are content with their health care coverage – they like their plan and they value their relationship with their doctor. And that means that no matter how we reform health care, we will keep this promise: If you like your doctor, you will be able to keep your doctor. Period. If you like your health care plan, you will be able to keep your health care plan. Period. No one will take it away. No matter what. Pretty straightforward statement, that. And punctuated with not just two spoken “periods,” but there’s also that “No one will take it away. No matter what.” thrown in for added emphasis. And he said it again, and again, and again. Check the videotape. To claim now that this wasn’t a central selling point for the law, but was “gratuitous rhetoric” or “imprecise language” is nothing more than hogwash. And it was well known to anyone who cared to look beyond the political rhetoric that millions were likely to lose the plans that they liked. The fact is, it was likely well known to the man who made the statement in the first place. But perhaps they didn’t all lie; it’s possible that some of our politicians on the left never cared to look beyond the political rhetoric. Take comfort, fellow citizen; the republic is safe in the hands of wise leaders. Speaking of wise leaders, some longstanding members of the Democratic caucus are now reduced to… well… babbling incoherence? House Assistant Democratic Leader James Clyburn, D-S.C., said Democrats don’t owe the public an apology for promising that people could keep their health insurance if they wanted to — despite insurers in recent weeks dropping millions of Americans from coverage. “I have not apologized, because I think that all of us, when we were advocating for this legislation, we said time and time again that we wanted to get rid of discrimination against people with pre-existing conditions,” he said. Work through that paragraph and get back to me on what you think Clyburn is trying to say. Best I can figure, he feels that no apology is owed to people who have lost their policies because Congress totally wanted to get rid of discrimination against people with pre-existing conditions (what one has to do with the other is beyond me, unless having insurance was considered a pre-existing condition). As for the second sentence, I have no earthly idea what he’s trying to express. Pelosi questions whether most Americans ever liked their health insurance. As of December 2012, nearly 70% of Americans rated their health care coverage either “good” or “excellent,” according to Gallup. And that’s a pretty long term trend, as far as I can tell. But perhaps we were all suffering from false consciousness. 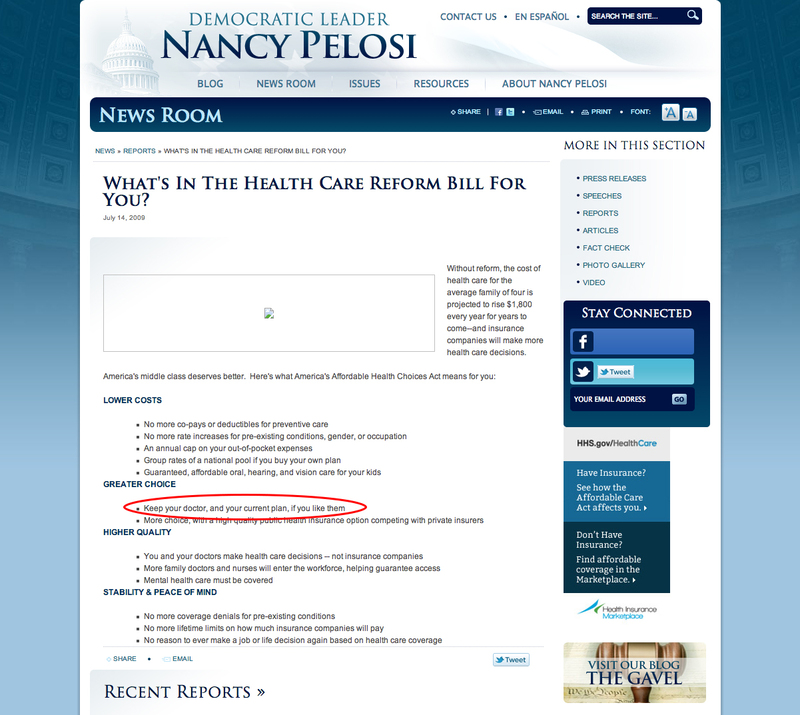 Regardless, Pelosi might want to mention this to her webmaster. Technically, she’s telling her constituents that if they like their plan, they can keep it as I’m typing this. Given current firestorm over coverage drops, Upton bill is seductive. But it’s impact would be to subvert ACA, not fix problem. the Department of Health and Human Services issued regulations saying that even if Americans had enrolled in plans they liked as of March 2010, those plans would lose their “grandfathered” status if minor modifications were made. Those regulations were issued on June 17, 2010. So, for three years and five months, insurers have been making business plans, designing their insurance offerings, and setting rates based on rules that were in put in place by Obama with the cooperation of Democrats in Congress. Put another way, insurers began canceling plans because Obamacare made those plans illegal. Now, just six weeks before the start of the new insurance year, Obama is telling insurers that the policies they were told would be illegal are no longer illegal. At least as far as the executive branch of the U.S. government is concerned. But, after 41 months of planning for one scenario, how do insurers put toothpaste back into the tube in the next six weeks? Very good question, and that doesn’t even get into the matter of whether or not President Obama even has the Constitutional authority to make such a move. And so, here we are. WH trashed ‘junk’ plans it will now try to restore — and hammered Upton bill, which it will now impose via Obama decree. Note that those “junk” plans will be restored – by popular demand. I have a feeling that this saga is by no means over. Like Celine Dion’s heart, it will go on and on. But this seems like an apt time to remind ourselves of a few things. First of all, if a private-sector health care firm behaved in the manner that the US Government has over the last six weeks, the company would likely be out of business by now, thus keeping the economic damage to a minimum. As it stands right now, we’re all going to be paying for this. This circus is taking place on the public’s dime. So enjoy it for what it’s worth. Even more importantly, this entire saga should remind Americans of why limited government is so vital to our freedom. Over the course of the 20th Century, the Federal Government went through a period of nearly unchecked growth under the banner of progressive thought and liberal politics. Most of the growth was predicated on the idea that the quaint ideas of the founding generation and their focus on individual liberty were fine in their time, but that with the dawn of the age of science and industry, new leadership must take over, and the tools of the state must be put to use to plan out the growth of society, to guide the direction of mankind. No problem existed that the state, with its cadres of experts, was not competent to address. And so the welfare state was born in America, and grew, and grew, and grew, birthing program after program, entitlement after entitlement, some moderately successful, some disastrous, but all expensive and incredibly difficult to reform or cancel. And now, here we sit with sixteen trillion dollars of debt (and growing rapidly), as much if not more poverty than we had before, and a bunch of social programs on the road to bankruptcy. THE GOVERNMENT ISN’T GOOD AT THIS STUFF, FOLKS. That’s why it needs to be limited. We need to take care of ourselves. That will, in the long run, be better for everybody, the poor and destitute included. * This is not to say that members on the right side of the aisle in Congress are somehow free of faults.